On how correctly arranged in the ceilingbath depends largely maintaining the desired temperature in the room and the service life of the structure. Even his height plays an important role: for a better warm enough to between the ceiling and the highest regiment was a space that allows you to sit comfortably in a man of bath cap. Despite the complexity of the task, with the installation of the ceiling can be managed independently and, most importantly, decide on the type of ceiling and a view of the materials used, as well as follow a few simple tips outlined in this article. which material is used during installation. As mentioned above, this is the optimalheight to sitting on the top shelf, not to get his head to the ceiling, but it should not be less than 2 meters. It is best to use when working carefully dried wood. 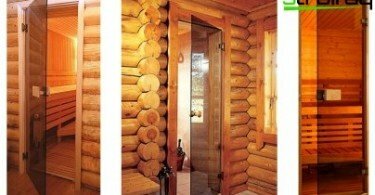 Most suitable for this purpose, the board of conifers, but for the inner liner preferably hardwood, for example, lime or aspen. Plank design, thanks to its tight fit, have good heat retention, but their selection is necessary to pay special attention to the resin content. 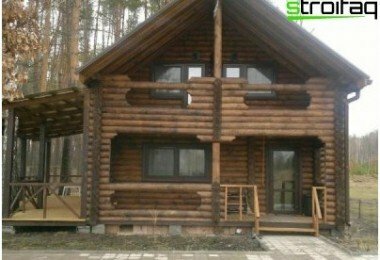 Wood with a lower tar has a low thermal conductivity, resistance to elevated temperatures and good sound insulation. The device includes a bath ceiling heat andvapor barrier. A good steam insulating layer is a dense film and can be used as a thermal insulator basalt fiber coated with a layer of foil. Tip: You can apply for insulation and are available materials such as earth, clay, sawdust or shavings. In small baths, in which the width of the passage is notmore than 2.5 meters, it is recommended that the ceiling device in the bath. Also, this option is suitable for buildings with main walls on the site of a conventional shield walls. Boards up to 50 mm thick plank directlyon the walls of the bath joint to joint. On top of the resulting board stelae steam and insulating layers. The vapor barrier can be used as a foil, roofing felt or roofing felt. 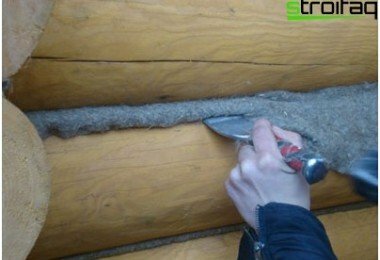 Next crumbles soft insulation, such as peat, which closes croaker, fasten it with nails to the beam. 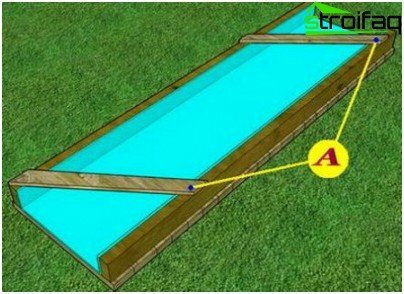 Council: instead of slabs of slate or you can use the self-made fire-resistant plate (dimensions: pitch beams x 300 mm x 20 mm), which pour out from the solution, consisting of four parts of clay, 0.3 part of cement, one part of sawdust and two parts water. Important: when using bulk materials as insulation is necessary around the perimeter of the attic to raise the fencing side. This will help avoid ssypaniya layer from the ceiling. A significant drawback of this method isinability to use the attic to move on it. This may lead to a breach of the insulating properties of the structure and the overall ceiling damage. This loft can be applied only to dry brooms and bath accessories. With big problems to face and when repairing floors or roof system, as in this case, the movement of the ceiling can not be avoided, and, therefore, can not be avoided and damage. But grazing ceilings are easy to mount and its cheapness. external ramp, located just on the part of the attic. That is, the insulating layers are placed as if in"Trough" for closing the top wooden flooring. Typically, these panels are rather heavy, which not only complicates the installation, but also the excessive burden ceiling baths. In order to facilitate a little bit of its weight, as the insulation is recommended to use basalt fiber or glass wool stacked layer of not more than 100 mm. Shields fit tightly to each other, and betweenthey placed an elastic pad made of waterproof insulation material. 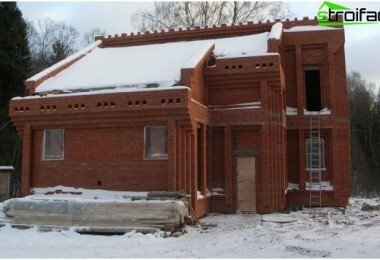 This is done to prevent the loss of heat through the mezhschitovye gap. Very well suited for this purpose with a felt lining of polyethylene or foil. The main advantage of the ceiling panel - its economy. After all, for the manufacture of panel boxes, you can use scraps of lumber left in the construction of the bath. But a disadvantage is a lot of weightfinished boards. If any other bath ceiling with his hands can do, and one person, the panel overlap requires the participation of several builders. More experienced people establish first empty boxes, and then, already in place, fill them with insulating layers and close the attic flooring. Tip: during the operation of the bath room on the top headliner water can collect. To avoid this, the ceiling should be stud with a slight slope about to 5 °. So how do the ceiling in the bath of the shieldpanels? 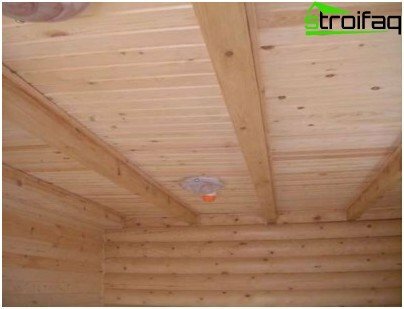 The device of the ceiling starts with the assembly of the structural elements. 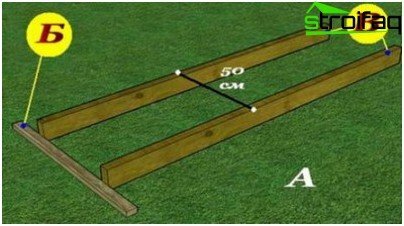 Two bar panels are stacked at a distance of 500 mm from each other, with their ends should rest against a flat rail, laid on the ground in advance. Top boards are attached to 600 mm longusing screws or nails ordinary, so that both sides turned the projection of 50 mm. This period is necessary for the subsequent placement of steam and heat insulating material between the boards. After all boards attached panelflips, and attached to it by means of steam, stapler or thin strips. To move the sheet in a bath bars needed to fasten together the two rails sideways, it will help avoid the construction distortion during transportation. Subsequently, these gantries are removed. Before installing the panels on the wall for them it is necessary to put a seal, for example, jute. After placing all panels on the vapor control layer is laid insulation and waterproofing followed. 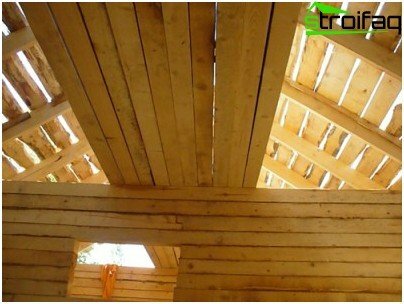 Important: panels connected to each other only by means of boards, in any case can not be used or screed mount the beam to the upper log bathhouse. Whole board with a length equal to the width of the stacked panels fastened with screws to their bars. Next to them is attached a few short planks, and then again one-piece board. Joints short boards are closed by means of rail waybill. Boarded ceiling - it's lining the raftersclapboard. Next on the boards stacked insulation layers, ie, steam, heat and moisture, and in that order. After positioning the waterproofing ceiling completely sheathed with boards from the attic. 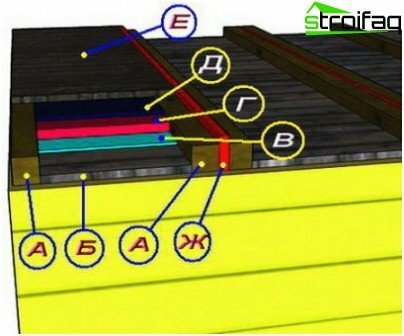 This kind of overlap is ideal for constructionbath with attic, since all layers of insulation are protected on both sides of the boardwalk. 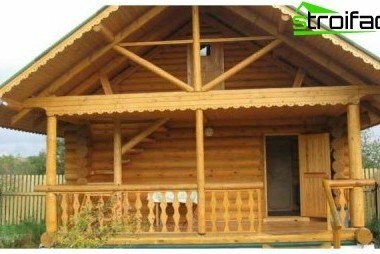 It is easily installed by one person alone, but the high cost of living is different, since it is necessary to purchase the massive beams and boards for covering whole span. Before a device of this kindceiling, it is necessary to prepare a sufficient number of edged boards (linings). First, fit the beam, and then issued a hole for the chimney. 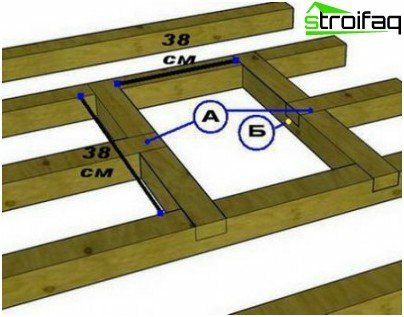 To do this in the crosspiece in the middle run slots into which is placed the central joists. The entire structure anchoring nails. Usually, the opening for chimney has dimensions 380h380 mm. Now you can begin the installation of the ceilingshield. For this vapor barrier is attached to the joists using a stapler, and before it all ends treated with a special antiseptic. Material is laid so as to overlap the walls have at least 150 mm. Next, take a board and edged by aplaner plane down a spike for a tight wall connection baths. Now, following the board place a thorn in the groove of the first board and connect them firmly, lightly tapping with a mallet over its entire length. Similarly, it is going the entire ceiling. After assembling the shield on the insulation vapor barrier is laid, and then waterproofing, which is covered decking planks attached to the joists using long nails. Council: nails for the installation of the ceiling in the baths is better to choose a hat with a broad and always galvanized. Their length should be at least twice the thickness of the plaque affixed. Nails can be used instead of screws of the same length. So, before you make the ceiling in the bath,you need to choose its type. Each design has its advantages and disadvantages, but most often used in baths boarded and paneled ceilings. Panel ceilings are different installation complexity, and it is this fact usually plays a decisive role in the selection. Besides podshivnoy different ceiling increased strength and durability.